Lowest Prices for the best trailer bearings races seals caps from etrailer. Bearing Kit, LM67048/25580 Bearings, GS-2125DL Seal part number BK3-310 can be ordered online at etrailer.com or call 800-298-8924 for expert service. Today were going to review part number BK3-310. This is the TruRyde trailer hub bearing kit. This kit will include one inner bearing, part number 25580, and its matching race which is part number 25520. It will also include the outer bearing, has a part number of LM67048, and the matching outer race which is part number LM67010. It will also include the cotter pin and it does include an easy lube spindle washer. And the final piece will be the grease seal which is part number 10-10. This is a double whip seal. The size on this seal has an overall diameter of 3.376, has an inner diameter of 2.125. And that should do it for a review on part number BK3-310. The bearings have held up well. I only use the trailer when I go boating so not many miles on it. Have not opened up the wheels since I installed so am only assuming they are still in good shape. The two seals you mentioned have different inner diameters. The part # GS-2125DL has an inner diameter of 2.125 inches and the part number 22558 has same dimensions as # RG06-070 which has inner diameter of 2.25inch. Both have same outer diameter of 3.371 inch. Lippert 5,200 lb axles use the grease seal part # GS-2125DL. For a kit that would include new bearings as well you'd want # BK3-310. 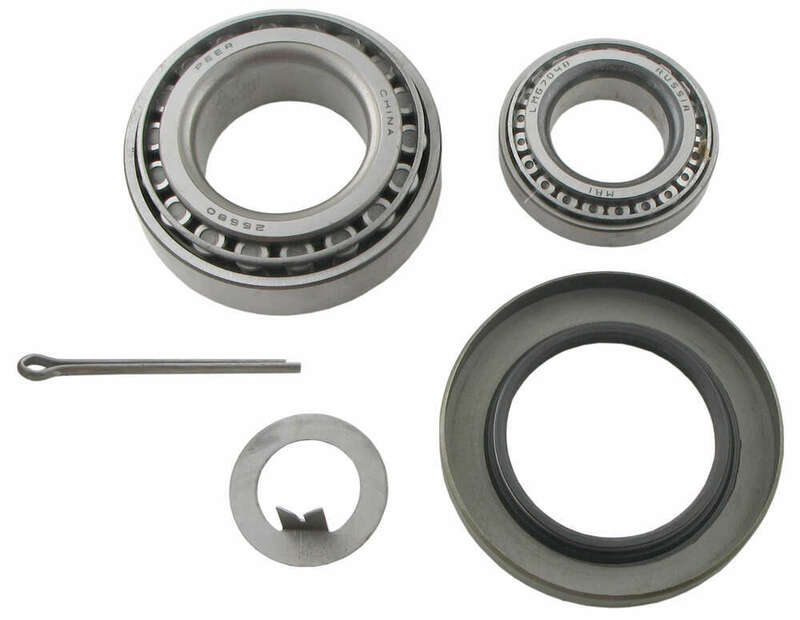 The bearing kit you are looking for is the part # BK3-310. This includes the bearings and seals you mentioned so it would be exactly what you need. My guess is you have the incorrect bearing kit. Kit # BK3-300 with Seal 10-36 # RG06-070 and Kit # BK3-310 with Seal # GS-2125DL have the same bearing numbers but the seals have different inner diameters. Seal # GS-2125DL has an inner diameter of 2.125 inches and Seal 10-36 # RG06-070 has an inner diameter of 2.250 inches. A difference of exactly 1/8 of an inch. If this is the case the solution is to get # GS-2125DL seals. Actually the bearing kit you will want is the Bearing kit part # BK3-300. This comes wit a seal that is the same dimensions as your CR 25558. The information I have is that the C/R 22558 seal has an inner diameter of 2.25 inches and an outer diameter of 3.371 inches. The Grease Seals 10-36, item # RG06-070, have a inner diameter of 2.25 inches and an outer diameter of 3.376 inches. The 10-36 is the seal that comes with the # BK3-300. The bearing you referenced, part # LM67048, we show as an OUTER bearing for applications in hub # 8-201-5. We offer this bearing as part of a kit along with inner bearing # 25580 and seal # GS-2125DL; the part number for the complete kit is # BK3-310. This included GS-2125DL seal has an inner diameter of 2.125 inches; if you can measure your spindle with a digital caliper you can verify the fit. The linked photo will show you where to measure. From the info you gave me you have a number 42 spindle but you would need to measure the inner diameter of the unmarked bearing to verify this. If it measures 1.75 inches that would verify that you do have the 42 spindle. 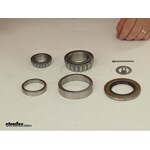 Then for a bearing kit you would need the part # BK3-300. The Dexter axle you have most likely needs the same seal as what comes with the part # BK3-300. The included seal has an inside diameter of 2.25 inches. Some times with your axle they used a smaller seal. This kit would be the part # BK3-310. The seal of this kit has an inner diameter of 2.125 inches. Easy way to tell is to measure the spindle where the bearings ride. If you have 2.25 you need the # BK3-300 or if you have 2.125 you need # BK3-310. What Size Bearings are Kits Available For? There are two possible bearing kits for your trailer's 5,200 lb axles. There's the more common part # BK3-310 and the less common part # BK3-300. The difference is the seal size. The part # BK3-300 has a seal with an inner diameter of 2.25 inch and the # BK3-310 has a seal with an inner diameter of 2.125 inch which is the more common size. I can't tell you beyond that which for sure would be correct. Both the 8-201-5 and the 426-56 Hub and Drum Assemblies you mentioned would use a grease cap with a 2.44 outside diameter. The EZ Lube Grease Cap, part # RG04-080 would be the correct cap for both hub/drums. The 8-201-5 hub/drum would use the # BK3-310 bearing kit, and the 426-56 hub/drum would use the # BK3-100 bearing kit. What you need is the part # BK3-300. The included seal with this kit has an inner diameter of 2.125 inches. Kodiak disc brakes that have a 6 bolt pattern all use the same bearings and races. It is kit # BK3-100. The outer bearing is # 15123. The correct size grease cap for an EZ lube axle would be # RG04-080 which is a 2.44 inch diameter. The race will have the smallest of lips for you to catch a flat screwdriver or piece of pipe on so you can knock it out of the hub. I have included a link to a video and a link to an FAQ article that should help you.